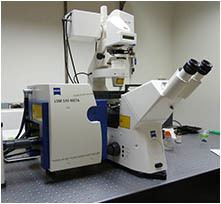 Inverted laser scanning confocal microscope with multiphoton (NLO) laser This confocal is on an inverted motorized Zeiss Axiovert 200 microscope. 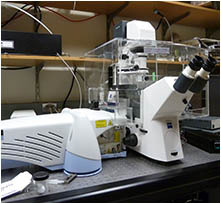 This microscope has the multi-channel META detector for spectral imaging. 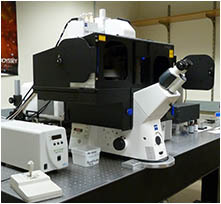 The multiphoton/two-photon laser (MP, a category of nonlinear optics, NLO) allows for deeper imaging of tissues. 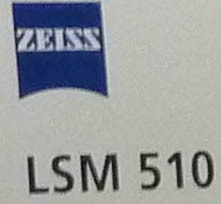 This microscope has a manual stage and no incubation. 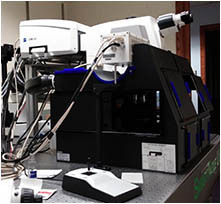 Two-photon imaging can be done with the NDD detectors as well as the internal detectors. 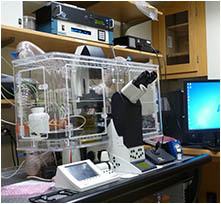 Location: Beckman Institute Basement Room B133G. 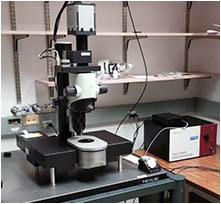 • This inverted microscope has the LSM 510 Scan head with 3 PMT detectors, 8 channel spectral detector (META), 2 GaAsp NDDs and 1 detector for transmitted light. 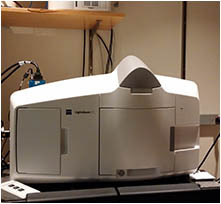 • NDDs are for imaging with the multiphoton laser and are more sensitive than PMTs. • Manual X,Y stage and motorized Z focus. 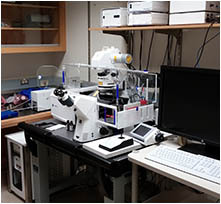 • Internal PMTs allow for far red imaging of NBT autofluorescence.